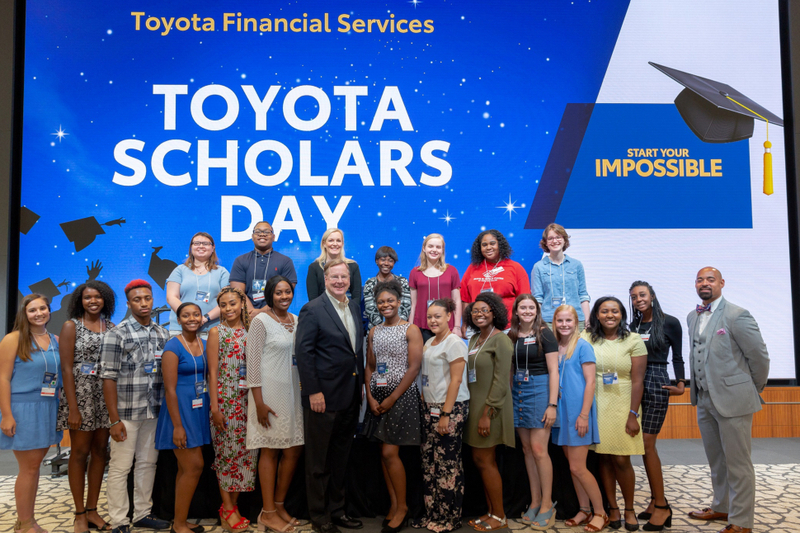 Making Life Easier scholarship recipients, chosen for their nonprofit affiliation, academic achievement and volunteer efforts, joined Toyota Financial Services (TFS) for Scholars Day in June. TFS has awarded $7.4 million in scholarships to 1,100 students since 2007. It’s the rush when the car first takes to the road after the assembly line. Or the tears of hope when a partially-paralyzed family member walks again. Toyota Scholars’ Day presented by Toyota Financial Services in June was about these moments of wonder and discovery. Through its MLE program, Toyota Financial Services awards college scholarships totaling $1 million to 100 students across the nation each year since 2007. Recipients are selected based on their academic achievement and volunteerism in the community. 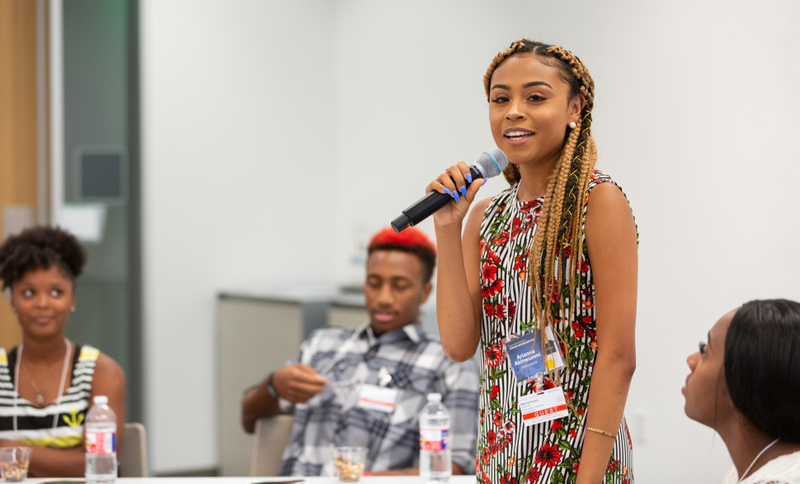 On June 26, 24 scholars from the North Texas area attended Scholars’ Day to meet MLE alumni, attend breakout sessions, tour the company’s new headquarters, and celebrate their accomplishments. At the event, scholarship recipients learned that Toyota is about moving people, whether it’s down the road in a vehicle or up the stairs by use of a robotic leg brace. Breakout sessions – offered to both parents and students – went beyond simply celebrating the immense achievements of these young people. The student session, with previous scholarship recipients and Toyota interns on the panel, provided a safe space for the students to interact, discover, and ask questions about college and life experiences that they may not have felt comfortable asking in front of their parents. “This was the first time we led this kind of celebration, really focusing on the students and their awareness to the possibilities within Toyota,” said Erika Doolittle, national manager of Corporate Social Responsibility at Toyota Financial Services. As Scholars Day concluded, TFS President and CEO Mike Groff addressed the crowd and shared the history of Toyota, explaining that what started as a loom company, to this day, continues to evolve beyond an automotive company. 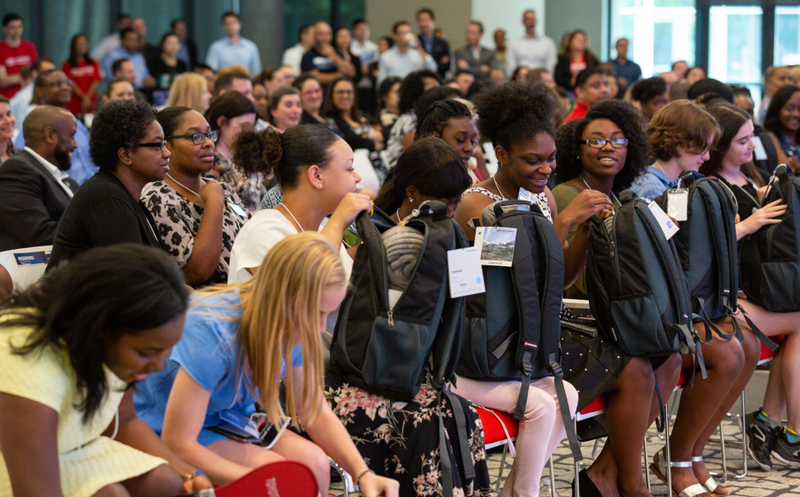 During the celebration at Toyota Scholars Day, Making Life Easier (MLE) scholarship recipients were thrilled when Toyota Financial Services (TFS) provided backpacks stuffed with goodies to prepare them for college, including brand new laptop computers.